At the heart of the Exodus is a recitation of the Decalogue, a "contract" between Yahweh and Israel that inscribes Israel into the fabric of human societies while emphasizing its uniqueness through Yahweh. According to the demands of the Decalogue, manhood entails the avoidance of stealing, killing, and coveting, not to mention apostasy and violation of the Sabbath and other men's property. What, then, would be the essence of womanhood, if different? Is there an exclusion of women from active participation in the Sinaitic theophany and, consequently, from active sharing of responsibility and identity? How ethically normative are the Ten Commandments? And, in terms of the present study, how gender specific are they? This study reclaims the encoded voice of womanhood, or rather the code of women as one crucial key for comprehending the ancient Israelite mind. By selecting female characters' narratives as interpretative clues for the "law", this book presents a reading of the Decalogue at three levels: legal, behavioral and representational. 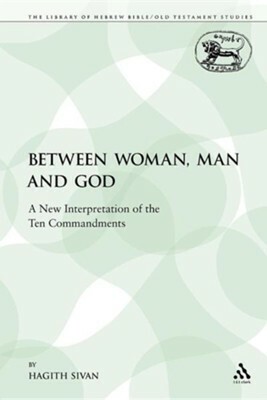 I'm the author/artist and I want to review Between Woman, Man and God: A New Interpretation of the Ten Commandments.